I was greeted with sunshine when I walked onto campus this morning, so this could well mean a glimmer of hope for getting a sail in this weekend, but I guess time will tell – its a little too soon to get any kind of concrete forecast. I’m certainlygetting excited at the prospect of not having any more exams though it must be said. I say all of this while sitting in the Roger Stevens cafe with coffee and such basically waiting for my exam this afternoon at 1pm. Normally I’m grateful for haing a sleep pattern that permits me to get up early and make the most of the day, but when you went to bed at 3am, this does tend to cause some problems. In an article on the bbc today a leading professor of law has spoken out about how old fashioned copyright laws are ruining the average persons chances of being able to creatively modify and make use of coprrighted works in order to create useful derivative works for personal and non-commercial use, in his words “turning kids into pirates”. All I can say is its about time someone spoke out about this issue. Not only are these laws out-dated, but they are broken every day, and for those who try to comply the costs are usually prohibitive to the extent where superb derivative work is bombarded out of existance. To cite a real-world example, a film created using clips and other material from a variety of sources cost a little over £100 to make, but cost over £250,000 in the end due to copyright laws. Is this fair on those who have a creative imagination and great tallent? In this case the film won high acclaim at Cannes in 2004. Its time that these laws were reformed. We no longer live in a world where creative work is done by the select few. We all have access to resources and tools to create, and all you need is imagination. It surely isn’t fair to price people out of existance purely for having an imagination and a little spare time – we deserve more than that. Came into uni today to have a look at some java in the computer labs and everything is closed. Confusion reigned supreme as I had to use the code to get into the lab while the department and all the stariwells were all locked. I know yesterday was a bank holiday, but today as well? How much holiday do they need! Some people seem to be on holiday all the time; I swear that over the last few days the whole world seemed to stop, and for what, so we could all do 15 times as much work on Tuesday or Wednesday to make up for what we didn’t do on the days we had off? Can’t really see the point in it all myself. I just had to blog about this now as I’ve just had a text message from a friend of mine saying that she has a new phone and new number because she managed to put her old one through the washing machine. While this is funny in it’s self (if not a little unfortunate), its not the first time I have had news of phones being broken in the most bizare ways. So far I have seen or heard about phones going through the following traumas; owner being thrown into a swimming pool (along with phone, resulting in complete ruination), having your bag (complete with phone) run over by a car, sitting on it (causing the screen to crack), plugging it into the wrong kind of car charger and it melting (I was as amazed to hear about this one as I’m sure you are to read it!) and last but not least flipping the flip clean off the phone (complete with screen, rendering it completely useless). So remember folks, when out and about, or even at home, take care of your phone – you never know when you might be putting it in grave danger! Its amazing when you really try, how many different weird and wonderful exceptions you can get out of Java. I was tinkering with some simple Java over MSN with Dan earlier and we managed between us to generate no less than 7 different types of exceptions all to do with file I/O, each seemingly more colourful and interesting than the ones that preceeded them. If only you could get marks for such wonders in the exam. In the true spirit of blogging I’m now listed on Technorati, an online service that links your blog to other blogs and keeps track of your postings so you come up when people are searching for things you are writing about. It also allows you to see who is linking to who from their blogs. It’s pretty neat. You can see a link to Technorati and some links to interesting information about my blog from the same source in the Technorati section of the nav bar, near the bottom. What’s especially nice is unlike MSN and MySpace and all of that, it syndicates 90% of your content so you don’t have to update it all the time. Its very much a register and forget system – something I find invaluable. Sparked by a large amount of alcohol the usual descent into political and general debate discussion that goes round in circles occured the other night before we all went along to Sarann’s house. Without going into comment about *how* the discussion started it essentially revolved around debating if the same crime (stealing), but committed for different reasons should carry any different penalties or negative opinion from society as a whole, and indeed if certain crime committed for certain reasons was even wrong at all. There were some pretty strong views floating around, and while one can never take these things too seriously, especially in the spirit of debate and the fact drink was a factor, some of the them were some of the strongest ones I have heard to date. To set the scene it essentially ended up that Matt and Kat took one side with Chris and myself taking the other. Matt’s view was essentially that if it was helping the little people or was selfless, then it didn’t matter if it was against the law becuse it wasn’t as bad as if someone had committed the crime for purely selfish reasons. While one can see his point, there is a flaw in the argument. In order to have a society of laws that works, each law must be upheld as much as any other. Society does indeed grade the severity of breaking laws by the sentance that each one carries, but to suggest that a motive should have a serious bearing on the sentence that a crime carries when the actual law that has been broken is the same would be to seriously devalue the law as a whole. Chris went on to say that there is always a loser in any incident of law-breaking and it is for this reason that every law should be upheld in the same way. No one can deny the moral factors though, and to give Matt and Kat credit, they seemed to have the moral end of things right. From a purely moral standpoint then yes, it is better to steal for someone else (giving to charity etc.) than for your own selfish ends. I think where the wires got crossed was that when looking at it from a legal standpoint. From a legal angle, you must treat the crimes the same. The bottom line is that as an individual you have stolen from someone else. Regardless of your reasoning, the crime is the same. A judge may look at the motive and pass an appropriate sentance, with the selfish one carrying a slightly harsher penalty, but as to if you should have the same criminal record and if both instances of the crime are “wrong”, then hell yeah. I could kill someone because they were about to shoot my friend, but would I still be a murderer? Yes, I would. Would I get the same sentance as if I had killed him in cold blood, no. And that is the only distinction we can make. 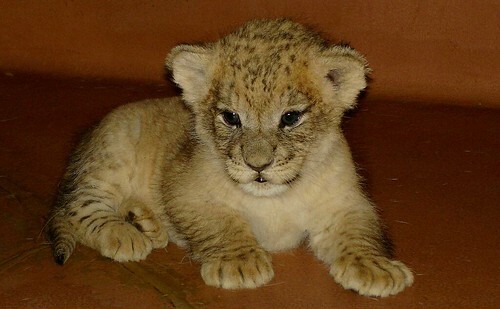 Its hard to believe that a lion starts out by being this small and kitten like, and ends up being able to chomp and mawl its way through anything. My real reason for posting this is the cute-ness factor though! Isn’t it just so “pick up and cuddle” worthy? Had my maths exam on Thursday morning; went pretty well as far as I could tell and the after-exam discussion seemed to confirm this. This means that I only have one exam left, Java programming, and its been a hell of slog to get to this stage I simply can’t wait to finish everything. The break described in the blog title was not only a gap in my blog, the large amount of sleep I got after the night out and the distinct lack of anything yesterday but also the oppertunity to catch up on a few bits and arrange a sail for the friday after my last exam next week, so 3 days on the boat should be a really nice getaway from everything. Also spoke to Sheena on MSN which was nice as we hadn’t spoken in quite some time.